The Wyoming Application Foreign Profit Corporation Application for Certificate of Authority is the primary means, for foreign corporations, to apply to the Wyoming Secretary of State for the right to operate as a profit corporation in the State of Wyoming. This document must be submitted with a Certificate of Existence (or Good Standing) issued by the home state of the foreign corporation within sixty days of the Application Date. The application must bear the exact True Name of the foreign corporation as it is reported on the Certificate of Existence being submitted with the application. This includes such nuances as punctuation, capitalization, or abbreviations. 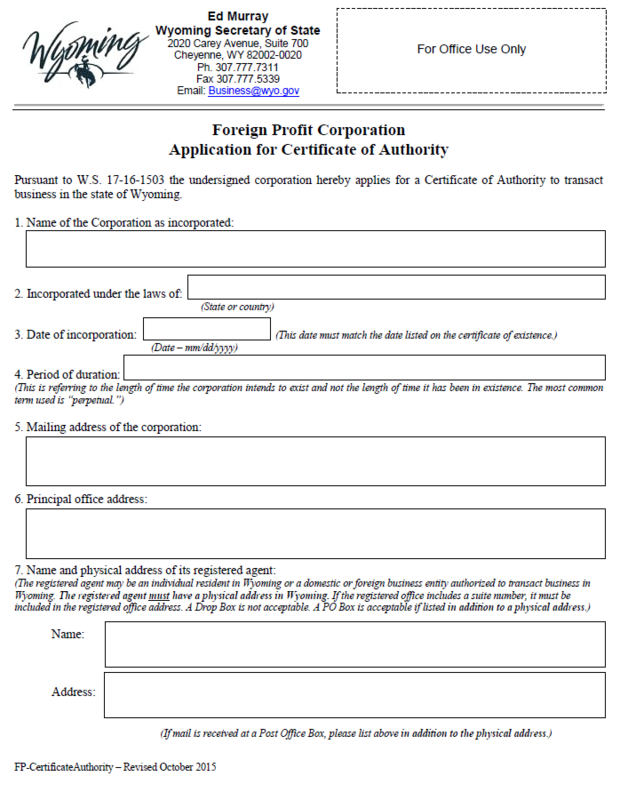 In some cases, the Name of a foreign corporation may not be used should it not be compliant with state regulations or unique. In such cases, the entity will also need to submit the Fictitious Name Usage form. You may submit the Wyoming Foreign Corporation Application for Certificate of Authority to the Wyoming Secretary of State by mail or online. If you do submit this paperwork by mail, it must be accompanied with a check for the $100.00 Filing Fee that is made payable to “Wyoming Secretary of State.” If you wish to pay by credit card, then you must submit this application online. The Mailing Address to submit this application to is Wyoming Secretary of State, 2020 Carey Avenue, Suite 700, Cheyenne, WY 82002-0020. You may submit this application online by going directly to the Wyoming Secretary of State’s Website here: http://soswy.state.wy.us/default.aspx. Step 1 - To obtain the Wyoming Foreign Corporation Application for Certificate of Authority by selecting the link labeled “Download Form” above. This will be a PDF form which may be edited with an up to date PDF program or a browser with the proper PDF form extensions. If you have either of these items, you may fill this application out on screen then print it. Otherwise, you may print it then fill it out. If you fill it out by hand, then you must use Black Ink. Step 2 - Locate the First Item on this form, “Name of the Corporation as incorporated,” then enter the Full True Name of the foreign corporation as it is reported on the Certificate of Existence the filing entity will submit with this application. Step 3 - Enter the Jurisdiction (such as a State or Country) where the filing entity is incorporated in the Second Item. Step 4 - Enter the Date the filing entity incorporated in its parent state in the Third Item. Step 5 - Some corporations only intend to operate for a specific period of time or duration. If this corporation plans on dissolving or terminating its status as a corporation then, you must report the number of years, months, and days until the corporation’s existence terminates. If the foreign corporation intends to operate without an intended Date of Dissolution, then enter the word “Perpetual.” Do this in Item 5. Step 6 - In Item 6, enter the Complete Mailing Address of the foreign corporation applying for this certificate. This should be composed of the Building Number, Street, any applicable Unit Number, City, State, and Zip Code making up this entity’s official Corporate Address. Step 7 - Report the Principal Office Address in Item 6. This must be the physical location of the foreign corporation’s Principal Address. This, too, must be composed of the Building Number, Street, City, and Zip Code where the Principal Office may be found. 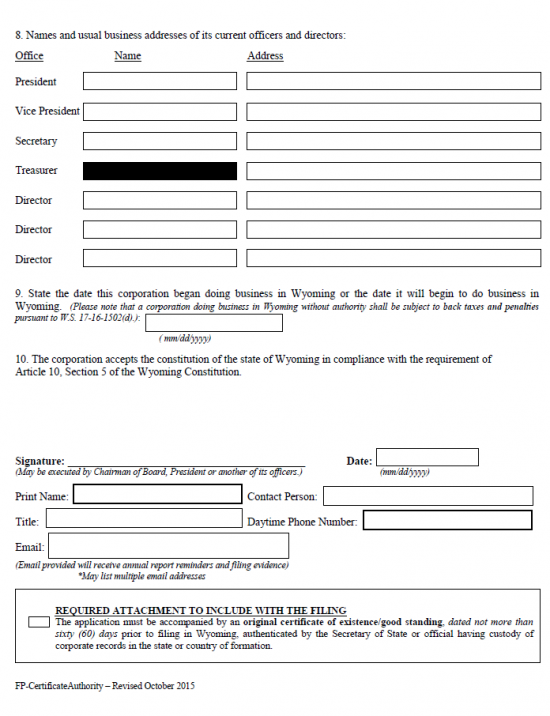 Step 8 - In Item 7, enter the Full Name of the Wyoming Registered Agent in the box labeled “Name.” Then, in the box labeled “Address,” report the Complete Address where the Wyoming Registered Office is Physically Located. Make sure to report the Building Number, Street, Unit Number, City, State, and Zip Code of the Physical Address of the Registered Agent. If the Wyoming Registered Agent receives his/her mail at a separate location then report this (Mailing Address) in the same box below the Physical Address. Make sure both addresses are properly labeled. Step 9 - Next, in Item 8, report the Full Name of the President, Vice President, Secretary, Treasurer, and Directors of this corporation. There will be a table provided to report on these offices and three Directors however, if there are more Officers/Directors then you must continue this listing on a separate document that is clearly labeled. Step 10 - If the foreign corporation has already transacted or conducted corporate business in the State of Wyoming, this must be reported. If so, then enter the Date business in the State of Wyoming was first conducted in the blank space provided in Item 9. Step 11 - Item 10 shall bind the foreign corporation submitting this application to the tenets of Article 10, Section 5 of the Wyoming Constitution. Step 14 - Locate the box at the bottom of the page labeled “Required Attachment To Include With The Filing.” As mentioned earlier, the filing entity must submit a Certificate of Existence/Good Standing with this application. This certificate must be dated within sixty days of the application’s Filing Date and must be issued by the governing authority in the foreign corporation’s home state. Place a mark in the check box here to indicate this has been included with the application being submitted.